It doesn't necessarily have to be a dichotomy...an either-or decision. You can keep your house clean, homeschool your children, and keep your sanity. Here are some tips for maintaining all three at the same time. 21st century living is cluttered. Most of us have far too much stuff. Our excess forces us to spend our days moving one pile from here to there and back again, dusting collections we don't need and can't afford, and managing and maintaining junk that doesn't bring us true joy. Determine what stuff aligns with your family's core values and purge the rest. If the thought of sorting through THE PILE seems paralyzing to you, might I suggest Organized Simplicity: The Clutter-Free Approach to Intentional Living by Tsh Oxenreider from The Art of Simple. It's an inspiring and practical look at how to minimize your stuff so that you don't spend your daily currency of life tripping over piles of excess. Once you've culled your home of all the unnecessary stuff, you'll find that you'll have much less day-to-day cleaning to do. Less junk equals less housework. It's just simple mathematics. 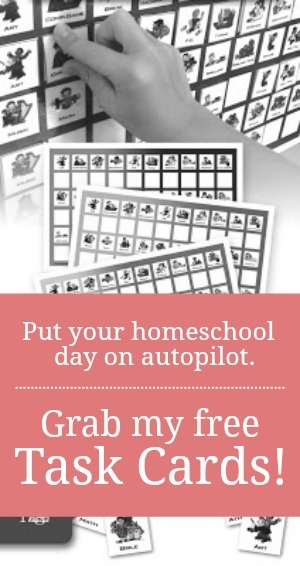 Routines are good for ANY household, but are indispensable for the homeschooling ones. Think about the current state of your house for a moment. Which rooms tend to become the messiest most often? Which areas seem to invite clutter? Perhaps you feel frustrated from seeing a grimy bathroom sink in the morning or a constant pile of shoes by the front door. Maybe you're overwhelmed by a heap of mail strewn across the dining room table or a hoard of Legos® littering the living room floor. Once you determine your trouble spots, begin brainstorming a routine that can help to keep that room/area from becoming problematic. For instance, if you find your bathroom sink in a constant state of grime, keep a stash of disposable cleaning cloths in the bathroom. Get in the habit of quickly wiping the sink down with a cloth after you brush your teeth in the morning. Or better yet, assign that job to one of your kids! If paper clutter continues to build, establish a time in the daily schedule when you will open the mail and deal with every.single.piece. Make it a goal to only touch your mail once. Open it. Deal with it. Then, file it or throw it away. Immediately. In addition, establish a few times in the day where everyone stops what they are doing and helps to do a "quick tidy." We do a five minute blitz-clean of the main living areas right after lunch (This is also when the kids do their daily chores. ), right after school, and just before bed. It will be much easier to keep a tidy home from day-to-day if you can establish good daily routines for the most troublesome areas. Encourage chore mastery and "mentorship"
Your kids should have assigned daily and weekly chores. That goes without saying. Doing all-the-things-all-of-the-time yourself will not only be a recipe for momma burnout, but it will also, undoubtedly, have a crippling effect on your children as they grow into adulthood. Remember, one of the main goals of motherhood is to work your way out of a job. So, definitely assign chores! But, be sure to assign chores with purpose. Doling out jobs willy-nilly without much intentionality can actually cause more work for you in the long run. I highly recommend assigning chores with mastery in mind. Mastery requires longevity. In my home, chores are assigned for the entire school year. No switching or trading. I assign new chores in a stair-step pattern at the beginning of the summer. Our summer schedule is looser making it the perfect time to teach life skills like chores. My oldest is on the highest step...meaning she's always assigned the most difficult chore throughout the entire school year. In the summer, she climbs to the next "step" or next most-difficult chore. I spend about a week teaching her that chore, a week monitoring and helping her with it, and a few weeks overseeing her progress. By the time school starts in the fall, she has learned the chore well enough that she can do it independently. In addition to learning her new chore, throughout the summer, she also has to help "mentor" my oldest son (the next oldest sibling) in her last-year's-chore. Since she did that chore every.single.day for the previous nine months, she's the perfect person to help guide him in it. I teach him the chore for a week, monitor her mentorship of him for a week or so, and then send them off to continue the training process for the rest of the summer. At the same time, he is also helping to mentor his younger brother (the third born)...and so on. Chore mentorship is a great way to cultivate leadership skills and sibling connectedness. No one wants to play Nagging Nellie all day long. I'm sure you'd much rather see your children doing their chores quickly, thoroughly, and with a happy heart than with begrudging disdain. By ordering your day in such a way that chores/responsibilities come just before privileges, you are helping to establish SELF-motivation. For instance, in my home, we have a well-ordered morning routine. Bibles have to be read, beds have to be made, and rooms have to be cleaned before breakfast. Since my kids generally wake up between 7:15 and 7:30 and my kitchen "closes" at 8, my kids know that they have a little more than a half hour to read their Bibles, make their beds, and clean their rooms before I serve breakfast at 8. If they are late, they don't get breakfast. ("If anyone is not willing to work, let him not eat." 2 Thess. 3:10b) There are sometimes extenuating circumstances which require grace. But for the most part, my kids are always done with their morning chores by 8. They want their breakfast. ~Little House in the Big Woods, pp. 28-29. Throw homeschooling into the mix, however, and that best-laid-plan will quickly feel like a yoke around your neck. But, what if you just scratched out the days and left the tasks? What if your schedule of personal chores was just a well-ordered list of TO DOs that had a purposeful rhythm? A loop? Here's a fictional example of a loop. At first glance, it might look like I clean the bathroom every third day (fictionally speaking, of course). I don't. While I would love to have a freshly-scrubbed toilet every three days, my schedule just doesn't allow it. But, with four young boys in the house, scrubbing the toilet (and a wide area all around the toilet...ahem) with REGULARITY is a non-negotiable! In fact, with the exception of washing the dishes and doing the laundry, toilet scrubbing is probably the job that needs my most frequent attention. So, I've given it more weight in the loop. After you decide upon a loop order/weight, be sure to write it down in your homeschool planner or your family notebook. You don't want to add mental lethargy or decision fatigue to your chore-time burdens. 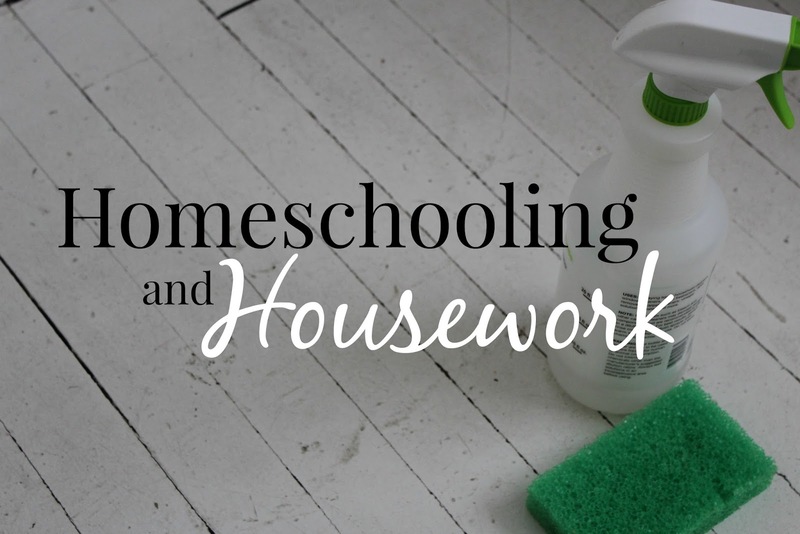 One of the many perks of homeschooling is that HOME and SCHOOL can be combined seamlessly. You can create a one-piece life, not an either/or dilemma. Home and School make for a great marriage of ministry. Practically speaking, this might mean that you do handwork while your children practice reading out loud to you...wash the dishes, fold the laundry, make dinner, etc. Use family chore time to listen to audio books/curriculum. My kids like to listen to historical audio dramas while they dust the house together on certain Saturdays each month. 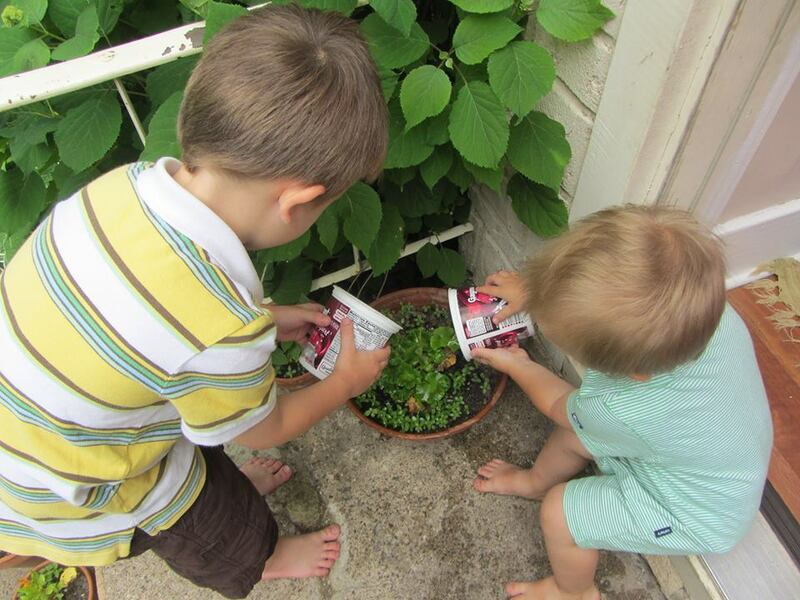 And my boys and I memorize Scripture with the help of Seeds while we mop the floor. Homeschool is a compound word for a reason. Don't compartmentalize the two. Keeping a tidy house is a never-ending job. And while cleaning might seem like an urgent and necessary task for the moment, it is only temporal. Mark your time by the eternal...by the things that matter most. The real truth about homeschooling...the real, unedited truth...is that while you're homeschooling, you are going to have times when your home doesn't look very good. But, sometimes good enough is GOOD ENOUGH. One day your home will be as clean as you would like it to be, but at that point, it will probably be empty. In this season of lots-of-little-oxen, you'll have to daily decide which priorities need your attention most. Sometimes your focus will have to be HOMEschool and other times it will be homeSCHOOL. 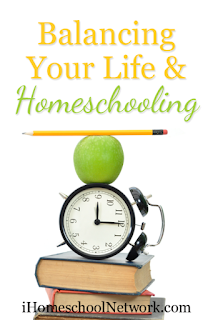 For more thoughts on balancing home and school, be sure to head to iHomeschool Network. This is great!! Some thoughts and ideas that confirm where I was headed. I had just realized a loop chore schedule was necessary and I actually love the keep the same chore idea. I'm curious about your kiddos responsibilities and what type of chores they do. I really enjoy your home management posts amongst the others. I would also love to see/hear/read about your stair step chore approach for the kids. Along with what chores are assigned to different ages and levels. I hope to write about that someday soon. What wonderful advice and ideas! Thank you! It is such a balancing act, but I absolutely love your take on how to fit housework in with homeschooling. Exactly what I needed to read today! The chore mastery and mentorship sounds like the next step in our home. I've been struggling with the kids and them doing/wanting to do chores. I need to set them up for success. They do however understand that responsibility is directly linked to privileges. Loved that bit of parenting you do! (from when you wrote about having a sidekick) Thanks for all your encouragement Jamie! Do you have a chart showing what your chore steps are? I'm really curious. Thanks! I don't have a chart currently, Elizabeth. I mostly just access the cleaning needs of the home each year and select a chore that I think my daughter is capable of learning. Teach it to her and move everyone up.